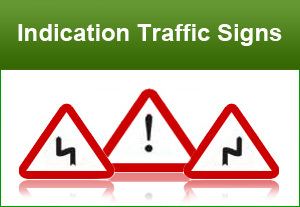 Traffic signs are broken down into 3 distinct categories, Mandatory, Indication and Informative signs. 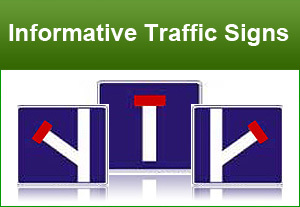 Mandatory signs are road signs which are used to set the obligations of all traffic which use a specific area of road. These signs tell traffic what it must do, rather than must not do. 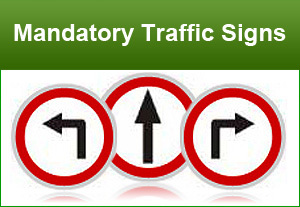 Most mandatory road signs are circular and use black symbols on a white background with a red border. Indication signs, or more commonly known as warning signs, let the drivers know of any upcoming hazzard that might not yet be visible giving the driver time to prepare. The indication sign is triangular in shape with a black symbol on a white background and with a red border. An information sign is a very legibly printed and very noticeable placard that informs people of the purpose of an object, or gives them instruction on the use of something. An example is a traffic sign such as a stop sign.